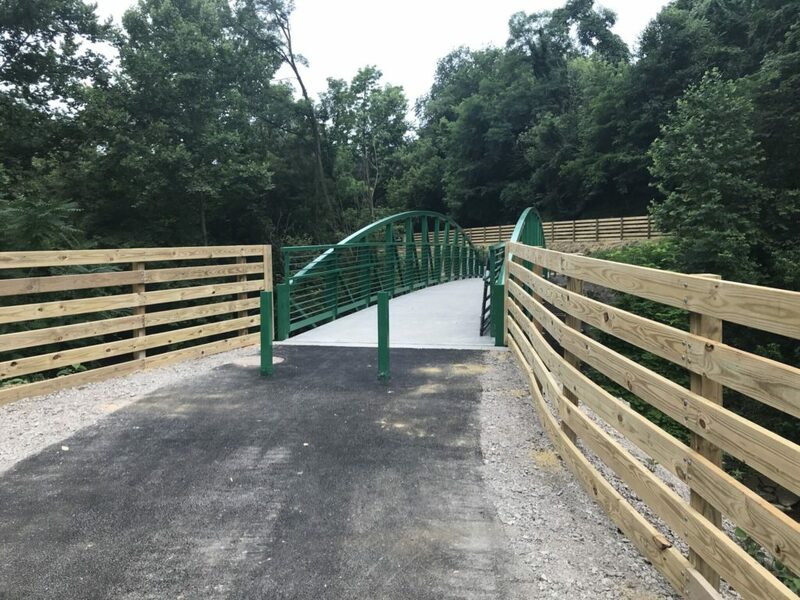 The Greenmont Bridge aka Kerns Crossing connects the Deckers Creek Rail-Trail with the neighborhoods of Greenmont and South Park. It connects to the rail-trail near mile 1 at Stanley’s Spot Dog Park. The site of this bridge – the end of Kingwood Street – was once the site of a vehicular bridge that carried traffic over Deckers Creek. This bridge was demolished in the 1960s, and the abutments still remain. Shortly after the American Revolution (242 years ago) the new government of the United States of America sent surveyors out into the frontier to scout out possible routs for new national roads. When the survey crew passed through the Morgantown/Greenmont area (at that time still Virginia) they discovered a “skillfully built and secure bridge” crossing Deckers Creek at Kerns’s mill. The surveyors reported back to the federal government a recommendation that the national road be routed through Morgantown because it could take advantage of the existing bridge infrastructure. The road was built and remains to this day as the Kingwood Pike. Incidentally Kingwood Street retains this name because it was originally part of the Kingwood Pike. Michael Kern was the first European to settle in Greenmont in the early 1760’s. His log cabin fort and Home still stands at the corner of Arch and Dewy Streets. Michael ran a grist mill at the bottom of Kingwood Street. Evidence of that mill can still be seen in the Creek bed when you stand on the new pedestrian bridge. Michael also built flat boats at Deckers Creek and the Mon. River. He grew wheat and hemp on the Greenmont (green hill) and sent it down river to destinations north and south.